Subject that emits the most recent item it has observed and all subsequent observed items to each subscribed Observer. This subject does not have a public constructor by design; a new empty instance of this BehaviorSubject can be created via the create() method and a new non-empty instance can be created via createDefault(Object) (named as such to avoid overload resolution conflict with Observable.create that creates an Observable, not a BehaviorSubject). Since a Subject is conceptionally derived from the Processor type in the Reactive Streams specification, nulls are not allowed (Rule 2.13) as default initial values in createDefault(Object) or as parameters to onNext(Object) and onError(Throwable). Such calls will result in a NullPointerException being thrown and the subject's state is not changed. Since a BehaviorSubject is an Observable, it does not support backpressure. When this BehaviorSubject is terminated via onError(Throwable) or onComplete(), the last observed item (if any) is cleared and late Observers only receive the respective terminal event. // no items and only the onComplete event in this case. Even though BehaviorSubject implements the Observer interface, calling onSubscribe is not required (Rule 2.12) if the subject is used as a standalone source. However, calling onSubscribe after the BehaviorSubject reached its terminal state will result in the given Disposable being disposed immediately. Calling onNext(Object), onError(Throwable) and onComplete() is required to be serialized (called from the same thread or called non-overlappingly from different threads through external means of serialization). The Subject.toSerialized() method available to all Subjects provides such serialization and also protects against reentrance (i.e., when a downstream Observer consuming this subject also wants to call onNext(Object) on this subject recursively). This BehaviorSubject supports the standard state-peeking methods hasComplete(), hasThrowable(), getThrowable() and hasObservers() as well as means to read the latest observed value in a non-blocking and thread-safe manner via hasValue(), getValue(), getValues() or getValues(Object). BehaviorSubject does not operate by default on a particular Scheduler and the Observers get notified on the thread the respective onXXX methods were invoked. 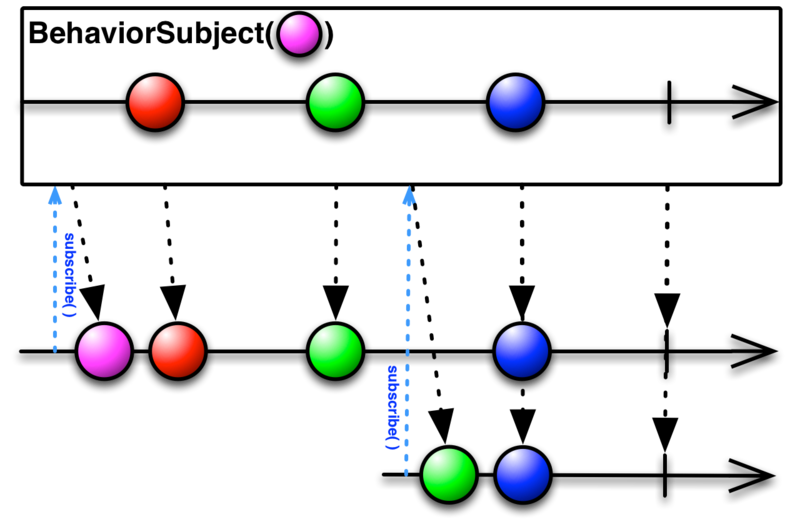 When the onError(Throwable) is called, the BehaviorSubject enters into a terminal state and emits the same Throwable instance to the last set of Observers. During this emission, if one or more Observers dispose their respective Disposables, the Throwable is delivered to the global error handler via RxJavaPlugins.onError(Throwable) (multiple times if multiple Observers cancel at once). If there were no Observers subscribed to this BehaviorSubject when the onError() was called, the global error handler is not invoked. // observer will receive all 4 events (including "default"). // observer will receive the "one", "two" and "three" events, but not "zero"
Creates a BehaviorSubject without a default item. Creates a BehaviorSubject that emits the last item it observed and all subsequent items to each Observer that subscribes to it. Returns a single value the Subject currently has or null if no such value exists. Returns true if the subject has any value. Notifies the Observer that the Observable has finished sending push-based notifications. Notifies the Observer that the Observable has experienced an error condition. Provides the Observer with a new item to observe. Provides the Observer with the means of cancelling (disposing) the connection (channel) with the Observable in both synchronous (from within Observer.onNext(Object)) and asynchronous manner. Operator implementations (both source and intermediate) should implement this method that performs the necessary business logic and handles the incoming Observers. There is no need to call any of the plugin hooks on the current Observable instance or the Observer; all hooks and basic safeguards have been applied by Observable.subscribe(Observer) before this method gets called. The Observable may call this method 0 or more times. The Observable will not call this method again after it calls either Observer.onComplete() or Observer.onError(java.lang.Throwable). If the Observable calls this method, it will not thereafter call Observer.onNext(T) or Observer.onComplete(). The Observable will not call this method if it calls Observer.onError(java.lang.Throwable). Returns an Object array containing snapshot all values of the Subject. Returns a typed array containing a snapshot of all values of the Subject. The method follows the conventions of Collection.toArray by setting the array element after the last value to null (if the capacity permits).